Ok, I’ve been blogging for a couple of weeks now so I thought it was time to write about one of my favourite products, which is Clinique Moisture Surge. I was introduced to this product when I got a sample free with a magazine early in 2012. I loved it and was really disappointed when it ran out as this is something that I can’t really afford to buy. However, one day not long before Christmas I was wandering round town with the boyfriend when for some reason I mentioned Clinique, to which he responded ’oh I bought you some Clinique’! Realising he’d slipped up and revealed one of my Christmas present’s he agreed I could have it early but confessed he was slightly worried he might have bought the wrong product (although obviously I’d have been happy with anything Clinique!). It turned out he’d noticed how much I loved it and had tried to make a note of what it was so he could go and buy it for me. When he fetched it from it’s hiding place and he had bought the right thing I have to admit I got a bit emotional (clever boyfriend!). 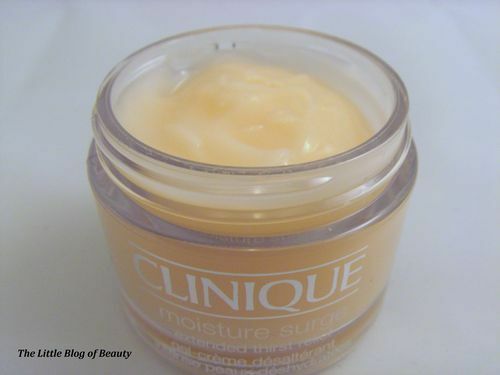 Clinique Moisture Surge is a fantastic gel-creme type moisturiser which is almost jelly-like and comes in a lovely light pink colour. This is so packed full of moisture you only have to use the tiniest bit for your whole face. It has an instant cooling and soothing effect and sinks in immediately to leave your skin feeling soft and hydrated and I find it even has a slight plumping effect. Particularly in the winter I struggle so much with my skin drying out and becoming tight and flaky and this is just amazing for making my skin feel so much better. At £32 it’s obviously slightly on the pricey side but I think it’s worth it and you really do only have to use a tiny amount each time so it should last well for the money. 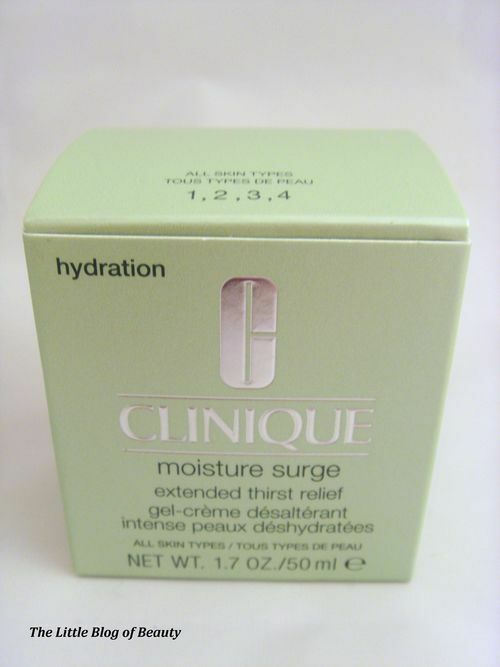 You can purchase Clinique Moisture Surge from http://www.clinique.co.uk/, Boots and department stores.